Hi there! Welcome to the fourth day of the May Neat & Tangled release countdown! All of the new products will be available in the Neat & Tangled Store on Friday May 5th at 8:00 am EST! 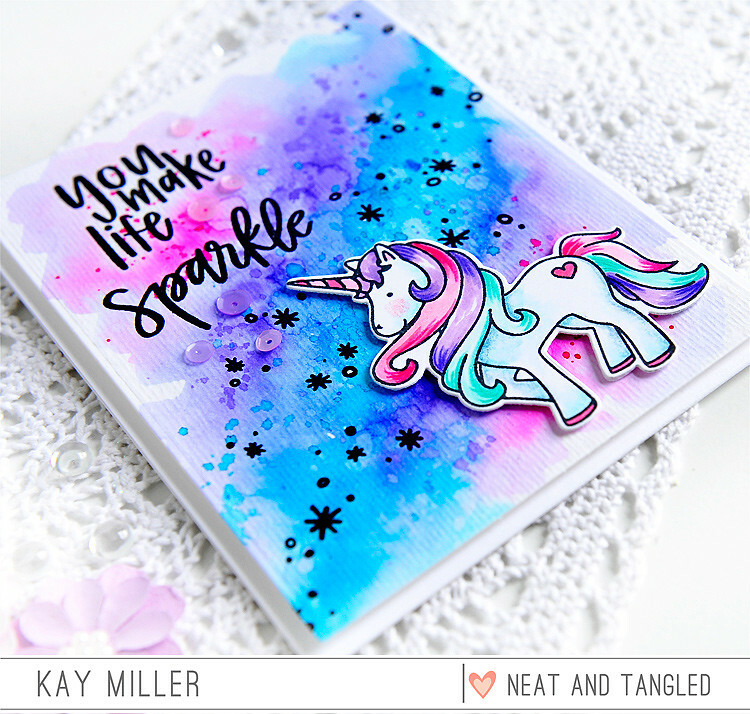 Today I'm showcasing the new stamp set Fairy Dust, along with the cute little unicorn from the Magical Day stamp set!. I first stamped the sentiment and the sparkles with waterproof black ink onto watercolor paper. I tried stamping them in white and embossing them, but really liked the way the black ones looked better. I then used my Peerless watercolors to watercolor the background. I colored the pretty little unicorn with Copic markers, cut it out with the coordinating dies, and adhered it with foam tape. I added some of the beautiful new Neat & Tangled sequins to finish it up! Awesome card! Gosh that background is stunning! I adore the bright, bold colors. And that unicorn looks fabulous with his mulitcolored mane and tail. Your work absolutely sparkles, Kay! So fun! :) Hugs! EVERYTHING about this card is amazing!!!!!!!! 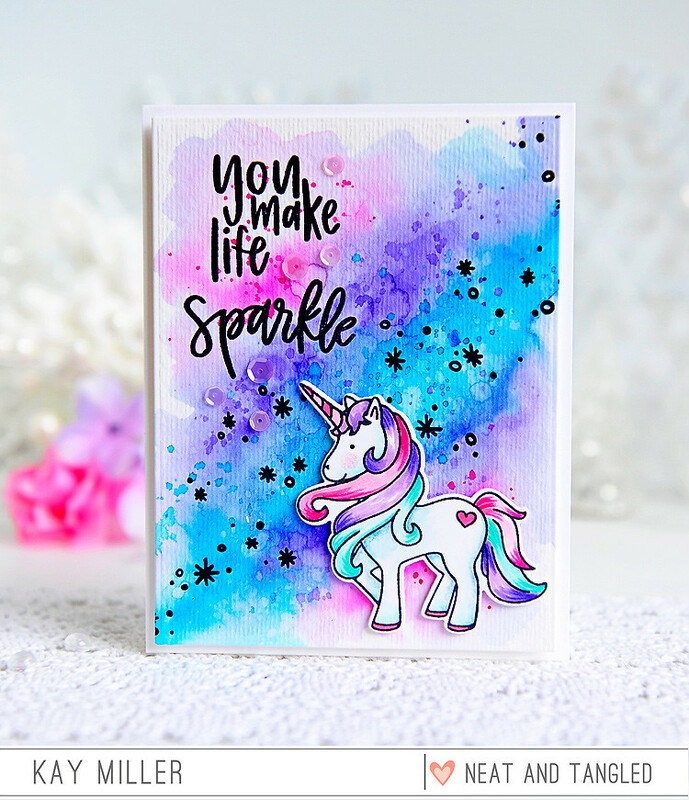 You've made my day sparkle in seeing your stunning background-and-unicorn card! Completely captivated! LOVE how the black pops against those gorgeous colors. Beautiful, Kay! The bands of colors looks great!!! Cute and such a great background! Oh Kay, this is adorable. I love your coloring. My grand daughter would love it. Will have to make this for her birthday. Great card! Your background is perfect, I really like this stamp set, the sentiment can be used for lots of occasions! Such a colorful card - great job. Beautiful sparkle creation Kay! Gorgeous background watercoloring...those Peerless colors are so pretty together! This really a regal looking unicorn. With your wonderful background Kay. Thanks for sharing. Lots of great stuff in this release. Very pretty in these colors and I like the addition of the sequins. You created a such beautiful watercolor background for that adorable unicorn. Nice job. Gorgeous card! 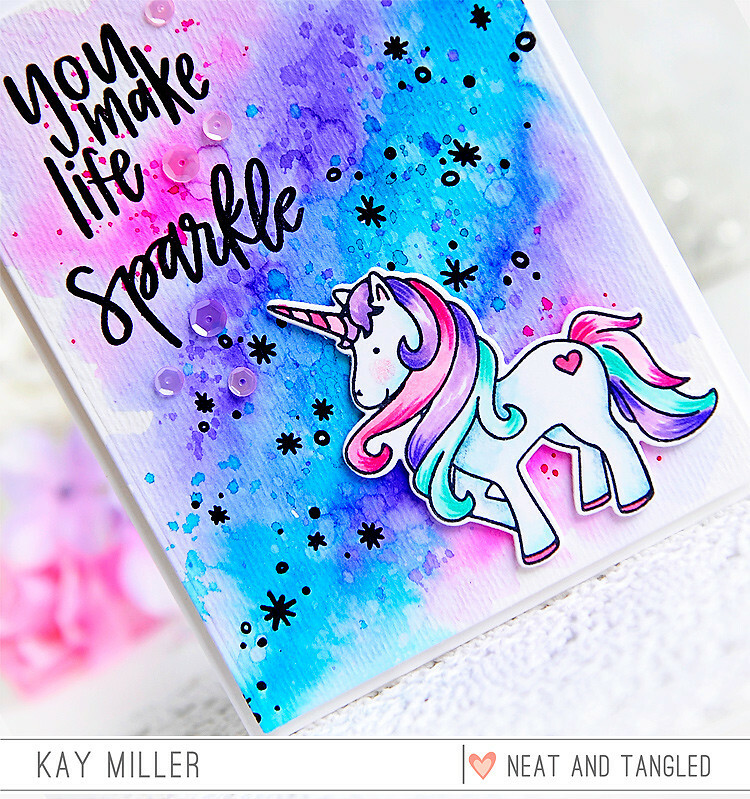 The watercolored background is beautiful and coordinates perfectly with that adorable unicorn! What a cute card. So vibrant and fun. Thanks for the inspiration! The colors are so vibrantly beautiful; gorgeous card. LOVE these colors, love the design - a simply magical card! Love the gorgeous colours you chose to highlight this stamp set...wonderful card. OMG! I'm definitely in love fot this awesome card!!! It's pure magic!!! Stunning bacground and colors!!! I think this is the perfect background and mix of colors for a unicorn! Cute card! !